Claude Irvin Wood was born on 30 June 1909 in Richards, Grimes County, Texas. He was known as Irvin. Rush Brevard Wood and Claudia Gertrude Bay appeared in the US federal census of 15 April 1910 in Grimes County, Texas. Other members of the household included Claude Irvin Wood, Mary Eula Wood and Henry Campbell Wood. The following appeared on 6 November 1910 in The Galveston Daily News: (Richards) Mrs. Rush Wood and children left Wednesday for Navasota to visit Mrs. Green A. Wood and little daughter. Members of the Haynie and Wood families, and some neighbors, were photographed in front of "the Haynie hotel" in Richards, about 1911. John Edwin and Stacy Scott Teague Bay were photographed with their children and grandchildren during 1915 in front of "the Bay hotel" in Richards. Students and teachers were photographed in front of Richards School in 1919. A bond for enlarging the school building was voted on 1 June 1918, and the photo likely celebrated its completion. Rush Brevard Wood and Claudia Gertrude Bay appeared in the US federal census of 1 January 1920 in Richards, Grimes County, Texas. Other members of the household included Claude Irvin Wood, William Boyd Wood, Walter Warren Wood, Solomon William Wood, Martha Clarana Reed, Henry Campbell Wood and Myrtle Ernestine Bay. Some Wood and Bay cousins were captured in a photograph, about 1925. He officially witnessed the death of Stacy Scott Teague on 5 December 1931 in Edcouch, Hidalgo County, Texas. He officially witnessed the death of Rush Brevard Wood on 25 April 1939 in Richards, Grimes County, Texas. The following appeared on 28 April 1939 in the Harlingen Valley Morning Star: (Edcouch) Mrs. J. M. Cellum received a message Tuesday night telling of the death of Rush Wood her brother-in-law, age 57, who died at his home near Houston following a short illness. Funeral services were to be held Wednesday afternoon. The deceased is the father of Irving who made his home here several years ago with his aunt, Mrs. Cellum and family. He married Opal Fern Martin, daughter of Hiram Fredric Martin and Esther Mae Greenhill, on 1 June 1939 in Hillsboro, Hill County, Texas. 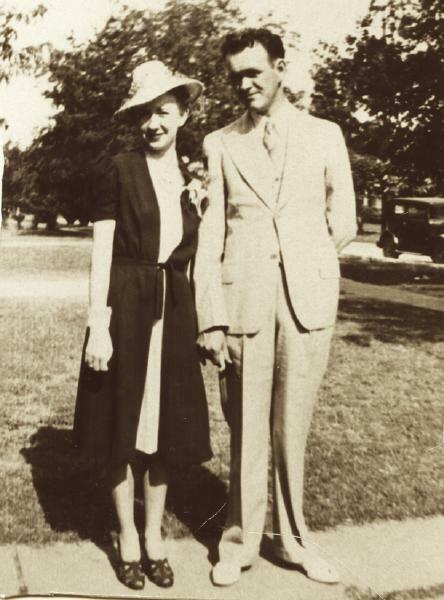 Opal and Irvin Wood were photographed just before leaving on their wedding trip, June 1939. Opal and Irvin Wood leaving on their wedding trip, June 1939. 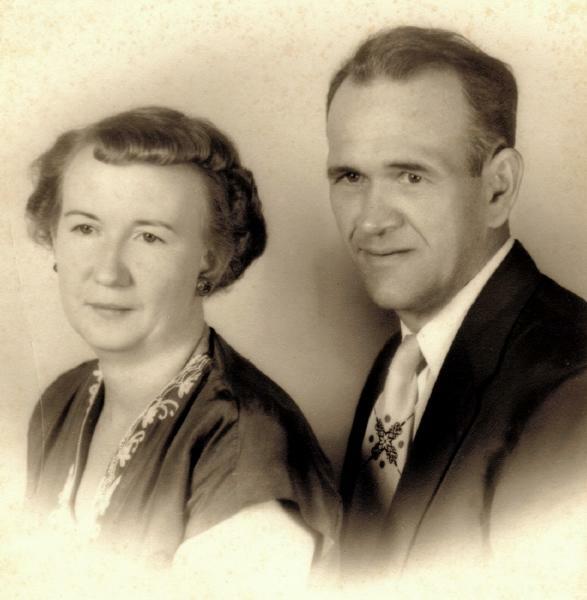 Claude Irvin Wood and Opal Fern Martin appeared in the US federal census of 1 April 1940 in Grimes County, Texas. He was employed as a bookkeeper by a general store, according to the 1940 census. Members of the Wood family gathered for a Sunday afternoon barbeque, about 1940. The following appeared on 10 July 1941 in The Brownsville Herald: (Edcouch) Mr. and Mrs. Irving Wood have departed for their home at Navasota following a visit here with an aunt, Mrs. J. M. Cellum, and family. Mrs. J. M. Cellum and daughters, Barbara Key and Johnnye Beth, are spending a month in Brownsville. 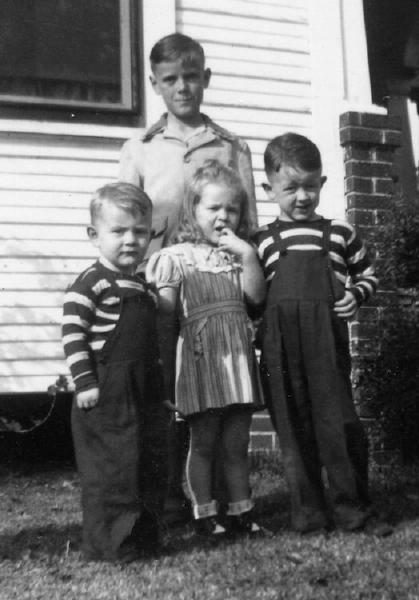 Irvin and Opal's children Rush, Patricia and Larry were photographed about 1947 with their cousin Warren Wood. A photographic portrait was made of Irvin and Opal Wood, about 1950. Claude Irvin Wood was appointed postmaster in Richards in 1954. Irvin Wood, his mother Claudia Bay Wood, and brother Campbell Wood, were photographed about 1955. 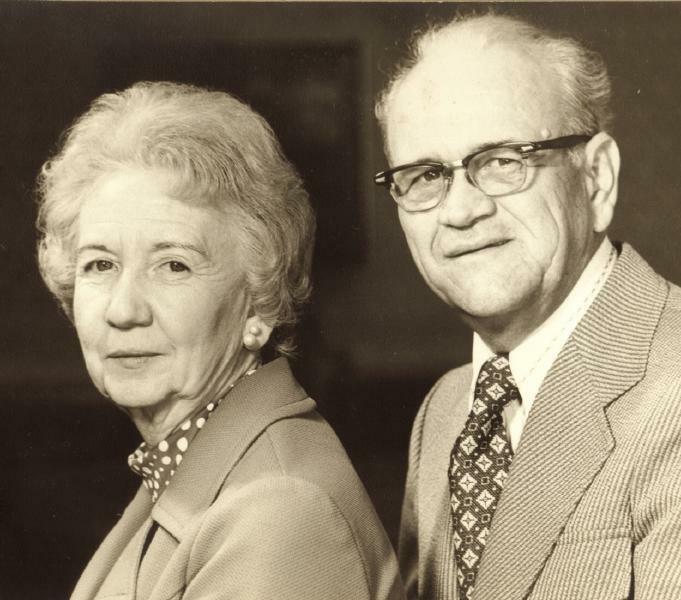 A photographic portrait was made of Opal and Irvin Wood in 1982. 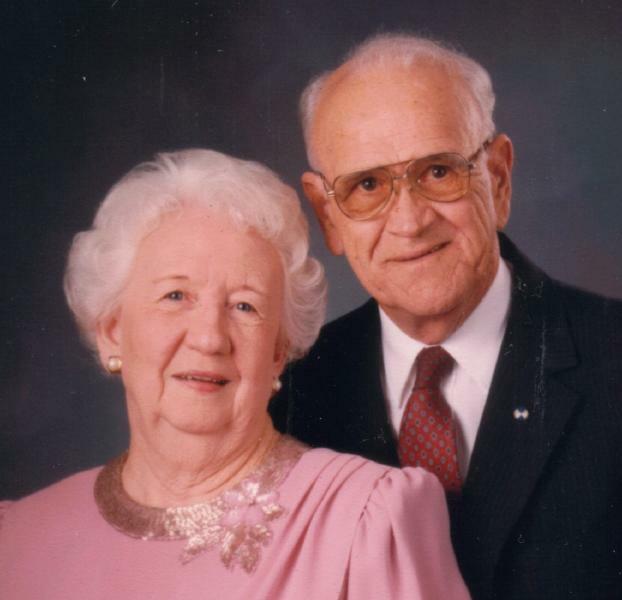 Opal and Irvin Wood celebrated their 50th wedding anniversary in 1989. 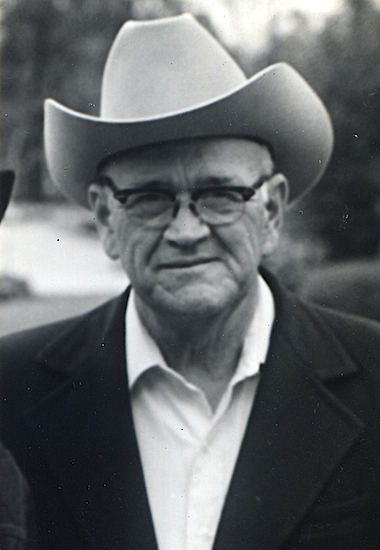 Claude Irvin Wood died on 23 December 1990 at age 81 in Grimes County, Texas. He was interred at Fairview Cemetery, Richards, Grimes County, Texas. The following appeared in The Navasota Examiner: Funeral services for Claude Irvin Wood, 81, a lifelong resident of Grimes County, were held at 2 p.m. Wednesday, Dec. 26, at the First United Methodist Church of Navasota. The Rev. Bill Dugger officiated. Cynthia Todd was vocal soloist, and Dennis Boring served as organist. Interment was in Fairview Cemetery near Richards under the direction of Nobles Funeral Chapel. Mr. Wood died at 6:30 a.m. Sunday, Dec. 23, at his residence. He was born in Richards June 30, 1909, the third of five children of Claudia Bay Wood and Rush Brevard Wood, one of the first merchants in Richards who later served as Grimes County clerk. Mr. Wood was a 1926 graduate of Richards High School. On June 1, 1939, he married Opal Fern Martin of Hillsboro. The Woods made their home in Richards where he worked in the grocery business before becoming postmaster. He served 25 years in the postal service as postmaster in Richards, postmaster counselor and rural carrier. After retirement in 1977, he became associated with Herterberger Chevrolet-Buick in Navasota. Mrs. Wood was a school teacher, serving 21 years as head of the homemaking department at Navasota High School. She retired in 1980. Mr. Wood, a descendant of Gen. Solomon Wood, who was credited with distinguished service in the Revolutionary War, was a member of the First United Methodist Church, the Sons of the American Revolution, the Sons of Confederate Veterans, the Noon Lions Club of Navasota, and the American Association of Retired People. His many civic activities included serving on the Grimes County United Fund board as a director from Richards, and serving on the County's Price Control Board during World War II. He was a past treasurer of the First Methodist Church of Richards and of Fairview Cemetery Association. Mr. Wood was noted for his knowledge of Grimes County history and was frequently called upon as a resource in this area. Preceding him in death were a brother, J. B. Wood, in 1915, his father in 1939, and his mother in 1963. Surviving are three sons and daughters-in-law, Larry Wood of Dallas, Rush and Louise Wood of Beaumont, and Reed and Janet Wood of Houston; one daughter, Patricia Wood of Navasota; grandchildren, Tyson, 23; Jason, 20; Melissa, 18; and Eva Wood, 17, of Beach Haven Park, N.J. and Glenn, 18; Paige, 16; Clint, 10; and Wrynn Wood, 7, of Houston; sisters, Mary Eula Jones of Galena Park and Gertrude Dostal of Richmond; along with numerous nieces and nephews. Pallbearers were Jason Wood of Beach Haven Park, N.Y. [sic], Glenn Wood and Campbell Wood Jr., both of Houston, Max Ray Brewer Jr. of Waco, Ira E. "Bud" Haynie and Warren Wood, both of Anderson, Jeff Haynie and Bill Hertenberger, both of Navasota. Honorary pallbearers were Wayne Boring of San Felipe, John Francklow of Shiro, J.P. Hicks of Richards, Lester Keisler of Anderson, Jody Harris of Galena Park, Dan Skelton of Montgomery, Sonny Ayres, Mike Dilorio, Lou Hertenberger, Carroll Kennard, Charles Kooken, William Albert Miller, Hugh Robison and Willie Shive, all of Navasota. A single grave marker identifies the graves of Claude Irvin Wood and Opal Fern Martin.